The catalpa sphinx is a common hawk moth, but the caterpillar is the stage most often encountered. 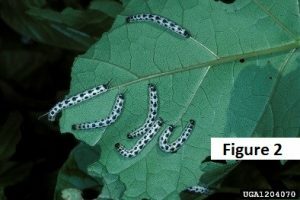 The caterpillars are commonly called catalpa worms or “catawba” worms and feed on the leaves of catalpa trees, often completely stripping the tree of foliage. 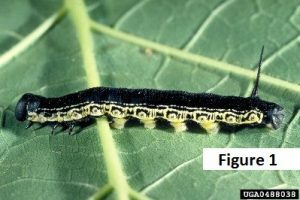 Catalpa is the sole host for this caterpillar and appears to have a symbiotic relationship with the tree, because the tree doesn’t seem to be affected by the complete defoliation at times. However, several years of complete defoliation may have an adverse effect on the tree. The caterpillar is better known as a terrific bait or fish. or yellow, and are gregarious, feeding as a group (Figure 2). As the caterpillars get older, they abandon their gregarious habit and begin feeding individually. 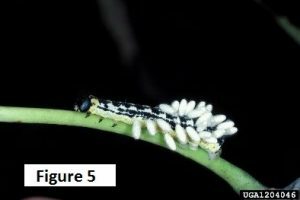 The older larvae are voracious feeders and will strip a tree in a few days (Figure 3). The catalpa sphinx moth overwinters as a pupa in the soil. 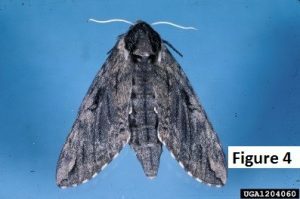 The adult is a moderately large dark moth. Since it usually flies at night, it is rarely observed (Figure 4). There are many natural enemies that attack the eggs and larvae that help to keep populations at somewhat low levels. One of the most important is a small braconid wasp Cotesia congregata Mason. Several eggs are deposited into the body of the caterpillar. After feeding for about two weeks the larvae emerge from the caterpillar and form white cocoons on the skin (Figure 5).